The Los Angeles LGBT Center’s Lily Tomlin/Jane Wagner Cultural Arts Center and Blanket Fort Entertainment have announced an extended run of the 2018 Hollywood Fringe Festival breakout hit Dr. Jekyll & Mr. Hyde. Nominated for six HFF Awards including Best Comedy, winner of the 2CentsTheatre Award for Distinctive Voices, and winner of the SoHo Playhouse (NYC) Fringe Encore Series Award, this genre-bending thriller had its world premiere at the Los Angeles LGBT Center’s Davidson/Valentini Theatre and returns for 10 performances only, July 12 through July 29. 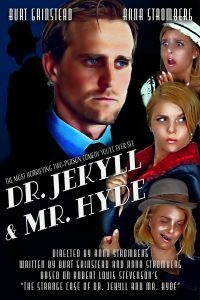 Written and performed by Burt Grinstead and Anna Stromberg, Dr. Jekyll & Mr. Hyde is a dizzying, fast-paced, horrifying and hilarious extravaganza that leaves the audience questioning its own morality. Based on The Strange Case of Dr. Jekyll and Mr. Hyde, the classic novella by Robert Louis Stevenson, this new adaptation takes place on the dismal streets of London in the 1860s, where societal pressures silence a gentle doctor’s questions about the nature of morality. As the pressure intensifies, Dr. Jekyll takes matters into his own hands. Will his efforts save the world, or will they destroy all that he holds dear? After all, the road to hell is paved with good intentions. Burt Grinstead has starred in films and television shows including Roger Corman’s Death Race 2050, NCIS, Criminal Minds, and many more. This is Grinstead’s fourth role at the Los Angeles LGBT Center, following dynamic performances in Deathtrap by Ira Levin, Hit the Wall by Ike Holter, and Fool for Love by Sam Shepard. 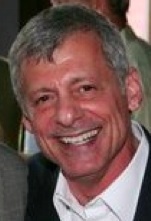 He was nominated for an Ovation Award for his portrayal of twins Peter and Craig in Dying City by Christopher Shinn at Rogue Machine Theatre. Anna Stromberg lived and worked in New York City for 10 years performing in various off-Broadway theatres. She was a longtime member of the edgy Amoralists Theatre Company, originating roles in collaborations with Daniel Aukin, Adam Rapp, and Lyle Kessler. She won critical acclaim for her portrayal of Vanda in Venus in Fur by David Ives at The Cape Fear Playhouse. She also stars in Well Wishes on Netflix and in the indie horror feature The Lost Footage of Leah Sullivan. Last year, Stromberg directed a renowned production of David Harrower’s Blackbird at the Los Angeles LGBT Center. The opening of Dr. Jekyll & Mr. Hyde is set for Thursday, July 12, at 8pm. The running schedule is as follows — Friday, July 13 at 8pm; Saturday, July 14 at 8pm; Sunday, July 15 at 7pm; Friday, July 20 at 8pm; Saturday, July 21 at 2pm; Sunday, July 22 at 7pm; Friday, July 27 at 8pm; Saturday, July 28 at 8pm; and Sunday, July 29 at 2pm. General admission tickets are $20 and may be purchased online at www.lalgbtcenter.org/theatre or by phone at (323) 860-7300. The Los Angeles LGBT Center’s Davidson/Valentini Theatre is located at 1125 N. McCadden Place (one block east of Highland, just north of Santa Monica Boulevard), in Hollywood, 90038.